Asura’s Wrath contains one of the most brilliant player-directed narrative sequences in videogames; a fist fight. The two brawlers dance about the screen, one trying desperately to explain his actions to the other among a flurry of attacks. To evade them, the player must nail the timing for the increasingly frequent on-screen button prompts as any mistake is punished with a fist to the face, interrupting the dialogue and completely ending the conversation. It’s a very specific kind of narrative device: it’s author-controlled, player-oriented and since that dialogue offered important characterization, each player experiences their own variation on a defined story. It’s completely scripted yet wholly natural. Above all, it’s simple. And just one of a dozen reasons why CyberConnect2’s game is so remarkable. They have succeeded at making a narratively-based game by coming at it from a different angle; making a game isn’t their priority. 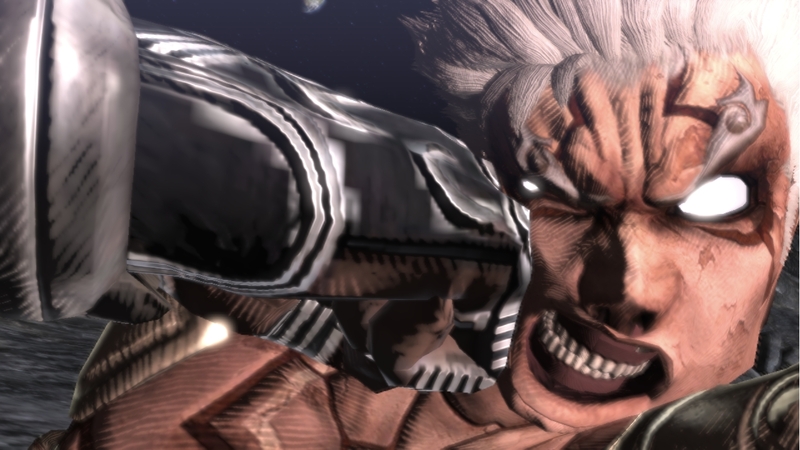 Through videogames, Asura’s Wrath redefines anime. Asura, one of the Eight Guardian General’s that protect Shinkoku, is angry. The first time we see him, he stands arms folded at the edge of one of the countless battle cruisers blanketing the sky, gazing down at the planet Gaea, his toes at the edge of an oncoming war. Then the title card pops. As if to make sure we’re ready for his adventure, we’re invited to Press Start. Hit it and Asura leaps from the ship and charges into the void below with all the fury and focus of Berserk’s Guts. After a short-lived reprieve, Gaea has been overrun with Gohma, corrupted beasts that threaten to overtake the planet. The other seven Guardian Generals enter as the battle wages on, among them Asura’s solemn brother-in-law Yasha and their arrogant sensei Augus. Fueled by the prayers collected by Asura’s daughter Mithra, the cybernetic Guardian Generals tear through the Gohma and ignite the heavens under the command of Deus, the powerful Lord weary of the endless battles. As the warriors breach the battle lines, Vlitra, the manifestation of the Gohma’s hatred, nearly cracks the planet in half and reveals itself after a millennium. Then the game cuts to a mid-episode bumper. The commercial-free commercial break makes sense given the opening credits and sets up the expectation for ‘to be continued…” and next episode preview ten minutes later. There are probably a number of reasons why CyberConnect2 chose a traditional anime series structure for their hybrid anime-game, from an attempt to honor the forebearers that inspired it to acting as a mechanism to regulate the games pacing. The name Seiji Shimoda will appear as Director in every episode but other names will be attached to individual ones. It allowed development to be divided without making the seams in the fabric jarring to the audience. Every episode has a beginning, a middle and an end. The Eight Guardian Generals prove a challenge for Vlitra’s horde, but none of them can match Asura’s bottomless pit of rage, a deep seated fury that allows him to destroy the abomination in a single, multi-armed punch. In the renewed respite, the demi-gods return home to the promise of peace. And then Asura finds his wife murdered and he framed for assassinating the Emperor. Lord Deus’ secret coup is put into motion and the lightning god casts the disgraced father down into Naraka and kidnaps Mithra. Falling to Gaea like a meteor, Asura proclaims his vengeance. When he finally claws out of the underworld, 12,000 years have passed, the Generals have deified themselves and set out to collect the prayers of their people in preparation for the inevitable resurrection of Vlitra. When a story is as rigorously defined as it is in Asura’s Wrath, the player becomes an actor in its play, performing the actions that reveal the unfolding spectacle. With Quick Time Events as cues, they’re given direction for actions that fit the context of their incredibly engaging scenes. Where the QTE’s are Asura’s Wrath’s primary means of storytelling, the combat between them is built on two types of player-directed action. The first is a simple beat ‘em up with a move set consisting of little more than an attack, heavy attack and ranged firing mode. Despite its simplicity, the combat has depth; the attack button can be used to catch enemies into combo strings, charges or air juggles. The gameplay certainly doesn’t have the richness of God Hand or Bayonetta but you have a rounded set of options. The second comes as a rail shooter that has the character speeding through scripted sequences unleashing a volley at enemies while evading their attacks, the evolution of the form so well realized by Sin & Punishment. This is what you need to notice about these two types of gameplay- one builds fight scenes, the other builds chase scenes. The mechanical simplicity is meant to provide an efficient versatility over a range of gameplay scenarios. But given that each button is consistent across modes, playing the games cinematics reinforce your understanding of the fighting mechanics and vice versa. Little about Asura’s Wrath is wasteful. Actions build up Asura’s Burst Gauge. When it’s filled, a giant flaming R2 prompt like a brand from Satan flares on screen and activates Burst, a mode that rockets Asura into an explosive rage and initiates a timing-based QTE. In practical terms, Burst is a narrative device that effectively resolves that scenes tension and ends the story beat. They’re micro goals used to create a rhythmic pace. Bursts build scenes which move the story forward. If you accept the acting metaphor, consider your performance in the two action modes as improv dance among the other actors on stage. As such, there is something almost beautiful about a battle completed quickly and cleanly, where you’ve jumped in and decimated your opponent with skill and nailed that satisfying pull of the burst button in one easy, error-free take that seamlessly transitions into QTE. Successes like that make up for the frustrating moments that don’t go as you’d like. CyberConnect2 deserves to be applauded for what they were able to accomplish with their character designs. While the Gohma admittedly look like amorphous red and black globs, the main cast is intricately detailed and capable of a wide variety of facial expressions. Watch the cutscenes to find incredibly nuanced and subtle animations, from the movement of their eyes to the articulation in their fingers. They sell these generated models as living characters and direction that was crafted rather than captured. The story would absolutely be less without them. From top to bottom, Asura’s Wrath is expertly produced. It’s choreographed with fight scenes that manage to clearly portray the action and doesn’t use the same tricks in the same ways. It has a quick, visceral visual vocabulary appropriate for its content. Even the power struggles are designed to test your endurance; they fight back and always make you feel like you’re one slipped button press away from defeat, even if you understand that they cheat to do it. If there’s a problem, it’s in one or two flashbacks too many that slow down the pacing. The sound design hits hard, the silence impacts and (especially in the case of Yasha’s Theme) the music energizes. The contrast between Shinkoku’s opulence and the people of Gaea is noticeable from the moment Asura falls. Typical of a totalitarian regime, the Seven Deities have commoditized their people, making each life disposable in relation to some nebulously defined social whole opposed to a centralized threat and purely to the benefit of themselves. Scenes where they slaughter entire villages rather than let them succumb to impurity are predictably cynical for their self-righteousness. Individually, the deities are well-defined archetypes for the amount of screen time they’re given but all constructing a complemented unit. Easily the most interesting is the melancholic Yasha, the cool blue to Asura’s burning red, cut to his smash, wind to his rock. Does Yasha wear his mask out of vanity or out of shame? The narrative is packed to the brim with classic anime themes and concepts right down to its cabal of gods that seems straight out of a Yoshiaki Kawajiri flick minus those blinking background shots, but it’s in how it upends those elements and videogame mechanics that it comes into its own. There’s a scene where Yasha talks to Deus in soliloquy, staring in the direction of the lord on his distant throne in the sky. Irritated at the empty gesture, Asura orders him to ‘Stop talking to yourself.’ Yasha is visibly perturbed, as if Asura had broken some sacred edict. I love it. Asura’s Wrath is a reconstruction of its genre; a martial arts version of Gurren Lagann that remodels the dojo DBZ built like Lagann refitted the mecha Neon Genesis Evangelion sent to scrapyard. Asura’s act is put in the players hand in many of the scenes with the Seven Deities, providing them with a ‘Shut up’ prompt that only forces them to listen until they can’t take it anymore. Asura is tired of the endless self-aggrandizing. By the end of his quest, you know exactly what sort of man Asura is: one that believes in justice and individual liberty, a man uncomfortable with the worship his acts receive and whose only fear is reserved for the welfare of his daughter. Yet it’s harder for him to extend his open hand to her as she cries than it is to throw it clenched at the cause. There’s psychology under the rage that not even he understands. He ends up being the most complex character in the story, just straight forward and direct. He always does what he knows is right, even if he doesn’t always know why. Where videogames have long tried to implement cinematic techniques onto a mechanical world, every element in Asura’s Wrath’s design was made to construct mechanics onto a cinematic foundation. At face value, that seems a semantic difference but it’s really very important and, for my money, far more honest. Everything in Asura’s Wrath is story-centric- even its title. Read those two words again: they are a statement of fact, imply an analysis of the root cause and promise a journey to quench it. It’s a wrath directed at the policies, the ideologies and the people that aggressively fight others from living the life they want. His game is about pushing forward and letting nothing stand in your way.